In a significant development, Giani Joginder Singh Vedanti, Jathedar, Akal Takht, has asked Giani Iqbal Singh, Jathedar, Patna Sahib, to attend the crucial meeting of Sikh clergy, scheduled to be held at the Akal Takht Secretariat here on July 10. Barring a few incidents of heated exchanges among supporters of different candidates, 300 Panchayats of district witnessed nearly 84 per cent of polling. The district election officer postponed the election for Behman Diwana Panchayat after an error was detected in the ballot paper. In the entire district, the polling was nearly peaceful. The Shiromani Akali Dal (SAD) has decided to launch a morcha from the second week of July against the atrocities being committed by the ruling Congress government against senior Akali leaders for the past one and half year in Punjab. The Health Department is in a state of paralysis at the top level as 21 of the 36 posts of Deputy Director and Civil Surgeon are vacant. The Punjab Government has ordered to relieve the Assistant Director of the Homoeopathy Department, Dr Ramesh Rattan of his post “for unsatisfactory service record and for possessing doubtful integrity”. Municipal Councillors of the Bharatiya Janata Party, Shiromani Akali Dal (Badal), (SAD-B) and an independent Mr Dharam Veer Seth an opposition leader of the House. Mr Surinder Kansra, Mr Sunita Handa (all of BJP), Mr Balbir Singh Bitoo (SAD-B), and Mr Kulwinder Singh (Independent) said here today that the Congress ruling Municipal Council, Batala was going to raise the water tariff and sewerage charges. The Laxmi Narayan Mandir Dham, Delhi, will do the gold plating of the ‘garbha griha’ (sanctum sanctorum) of the Durgiana Temple. 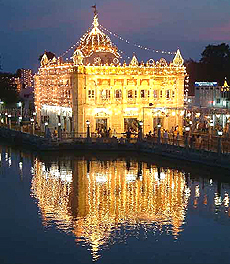 The gold plating will be done in the fourth phase of the kar seva on the premises of the temple on the lines of the Golden Temple, which would be completed in next three years. The district Cultural Society has relaunched its website www.faridkotonline.com 2000 to give information on activities of the different non government organisations, district administration and the Red Cross Society in Faridkot district. Punjab Government Transport Workers Union president and noted trade union leader Balwinder Singh Sandhu, who had received injuries in a road accident a fortnight ago, passed away in a hospital in Ludhiana last night. Bodies of sepoy Dalip Raj of Habibpur in Dinanagar block and sepoy Surinder Singh of Wahini Khader also in Dinanagar block who were killed in a suicide attack on an Army camp near Jammu yesterday were received today. The Vigilance Bureau today arrested three partners of Marwaha Rice Mills for their alleged involvement in embezzlement of rice belonging to the Warehousing Corporation, Gurdaspur. The police today claimed to have seized about 500 kg of poppy husk from a truck during checking of vehicles near the Fettudhinga octroi post on Saturday. Ms Tajinder Kaur, Principal Secretary to the Government of Punjab, Department of Education (Schools), has ordered to place under suspension with immediate effect Mr Inderjit Attari, head teacher of Government High School (GHS) Heron Kalan, Mr Kewal Krishan, Hindi teacher of GHS, Behniwal, Mr Inderpal, science teacher, Mr Kaur Singh, math teacher, Mr Nettar Pal Singh, lecturer, Ms Santosh Kumari, English lecturer and Ms Bimla Devi, Punjabi teacher, all of Government Senior Secondary School (GSSS) Mansa, and Mr Ruldu Khan PTI of GSSS, Budhlada, in the district. 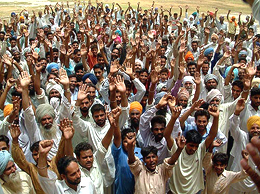 Resentment prevails among employees of the District Institute of Education and Training (DIET) Deon, village due to the non-payment of salaries for the past three months. The All India Council for Technical Education (AICTE) has recognised DAV Institute of Engineering and Technology here and allowed it to run new engineering courses from current session. Ms Laxmi Kanta Chawla, former BJP MLA, in a press note here today, expressed concern over the steep hike in the fee structures of colleges and universities. In a bid to revive the Urdu language, the Ladies Club of Guru Nanak Dev University has organised a month-long summer camp to teach the language to children. The Punjab Beopar Mandal has constituted a six-member anti-corruption committee headed by its patron Mr Bimal Gupta to check malpractices of the senior officers of various departments in the state.